At the top of the post, see a map (view in a larger format here) from the Cost of War Project’s Stephanie Savell, 5W Infographics, and the Smithsonian of all the regions where the U.S. is “combatting terrorism.” While most of the media orgs and non-profits mentioned above would probably dispute the use of that term in some or all of the conflict zones, Savell sticks with the official language to describe the situation—one in which the nation “is now operating in 40 percent of the world’s nations,” as she writes at Smithsonian.com. “The most comprehensive depiction in civilian circles of U.S. military and government antiterrorist actions overseas,” the America at War map provides information we don’t often get in our daily—or hourly, or by-the-minute—diet of news. “Contrary to what most Americans believe, the war on terror is not winding down.” It is expanding. Given the country’s history of sustained mass movements against legally suspect, grossly expensive wars with high civilian casualties, disease epidemics, starvation, and refugee crises, one would think that a sizable segment of the population would want to know what their country’s military and civilian defense contractors are doing around the world. 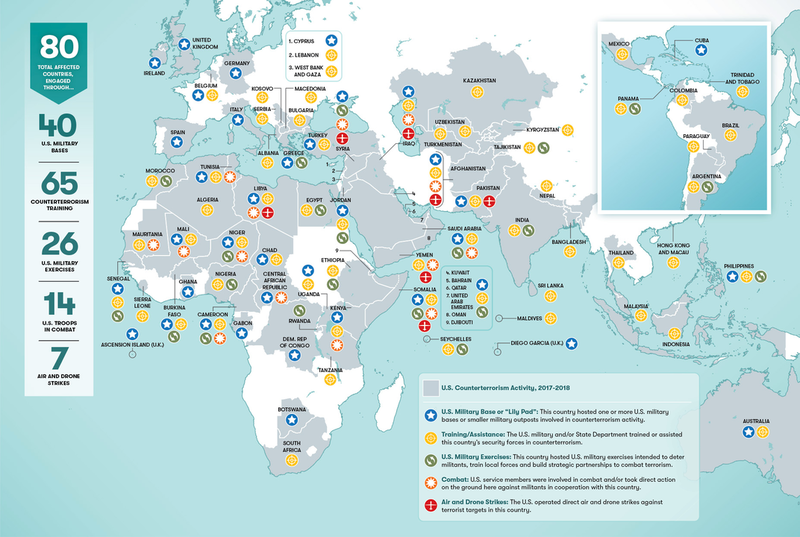 America at War: Infographic Reveals How the U.S. Military Is Operating in 40% of the World’s Nations is a post from: Open Culture. Follow us on Facebook, Twitter, and Google Plus, or get our Daily Email. And don’t miss our big collections of Free Online Courses, Free Online Movies, Free eBooks, Free Audio Books, Free Foreign Language Lessons, and MOOCs.